Pinewoods Montessori School (“PWMS”) encourages applications from all students. We look for children and families who share our goal of an environment where learning is natural, and where your child will joyfully and effectively develop independence and self-discipline while striving to reach their full potential. We welcome children ages 18 months to 12 years. Priority is given to qualified applicants who are returning students, siblings of currently enrolled students, children of faculty/staff members, children of PWMS alumni, and transferring Montessori students. We do not utilize specific academic entrance requirements. PWMS accepts students of varying academic ability and diverse learning styles. We welcome all students and families. Our school year runs from August until June. PWMS has rolling admissions and applications are accepted throughout the year. The admissions procedure is designed to give families an opportunity to learn about our school, its philosophy and policies, and to meet our teachers and staff. It also gives us an opportunity to assess each child’s situation and determine whether we are able to meet the needs and expectations of the parents/guardians. Children are accepted on the basis of readiness for school and potential for success in a Montessori classroom. It is equally important to determine whether the parents’ educational philosophy is compatible with that of PWMS. Our goal is to enroll families who will both benefit from and contribute to what the school has to offer. 3. A meeting/visit is scheduled with the child and a teacher. For elementary students, we request a full day visit as well as a brief parent-teacher meeting. We consider “enrollment” in PWMS to involve families as a whole, not just the student. We seek families who wish to work in partnership with the school on an ongoing basis and who will be committed to supporting the Montessori philosophy at home as well as at school. As such, we reserve the right to deny acceptance, at the sole discretion of the School, to those who do not demonstrate acceptance and support of our Mission. We may deny enrollment a student if the School determines, at its sole discretion, that it cannot adequately serve the needs of the child. The number of children who can be accommodated depends on Montessori guidelines and state regulations. When space is unavailable at the time of application, children may be placed on a waiting list at the parents’ request. 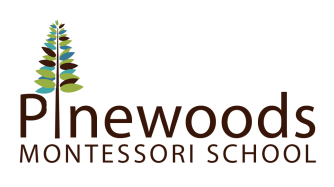 Pinewoods Montessori welcomes children, aged 18 months to 12 years, from all racial, ethnic and cultural backgrounds, family structure or sexual orientation. Priority is given to returning students, sibling, and transferring Montessori students. After these considerations, children are accepted from those in the waiting pool according to their stated program preference and long-term school goals.